! 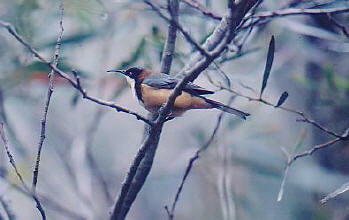 Eastern Spinebill! North Queensland, Australia. This is a beautiful little bird, coloured rufous brown underneath, greyish on top, with a black head, contrasting white bib, and a sharply downward curving bill. It's call is a series of piping whistles. Being a honeyeater, it feed regularly on nectar, and can often be seen hovering at flowers with a distinctive whirring sound of the wings like a sunbird or an American hummingbird. It inhabits the wetter environments along the east coast of Australia.